It was a gorgeous morning, the sun so bright as to be painful on the eyes. I ran along the front as far as the sailing club and back. I ran one of the wettest runs ever yesterday. I rarely wear more than a t-shirt, but today wore rainproof top, hat and gloves. I took a route out of Seaford similar to that taken by the Seaford 10K back in the summer, heading for High and Over, then out to Fiveways and back to the golf club, where I had left the car after last night's sailing club dinner-dance. Running from the new house, I find that the focus is always Seaford Head. So yesterday I ran along Chyngyton Road and took the tarmac road up to a car park. This ascent is one of the least enjoyable features of the Seaford Half Marathon, coming at around eleven miles, but is perfectly manageable as part of a much shorter route. Then I went to the edge of the cliffs and back down by the golf club. The weather was glorious. I managed a respectable 51:15, was 1198th out of 2312 finishers and came 111th out of 171 finishers in my age category. The weather was mild, unlike last year when I remember freezing before the start. I had the great pleasure of seeing Sara and Lou of Brighton and Hove AC running, and Claire of the same club cheering us on. I started a little too fast, but checked myself and kept up a steady pace for most of the run, east to the Marina, then west to the King Alfred centre and back again to finish on Madeira Drive.My pace slackened a little after the second turn in Hove, but I corrected it and had enough to spare to overtake a number of runners in the last two kilometres. Amusing sights: a group of children, dragooned into coming to cheer their father on, chanting 'where are you Daddy' over and over, Daddy clearly being a long way back in the field. Just to keep everything moving for Sunday, I ran another, faster two miles to the front and back. The weather was cloudy and dul, though the sun shone on some distant hills. By accident, I ran precisely two miles last night , for a short and easy run designed to keep everything moving before Sunday's Brighton 10K. I ran to Splash Point (five miles there and back from the old house) and a little way along the front. I was very slow, perhaps no bad thing in preparation for a faster effort in the race. Bright moonlight showed me a fox, who had been scavenging on the shingle beach, which surprised me. I do not think of the foxes as animals of the seashore. The Dieppe ferry, brilliantly lit, was on its way out of Newhaven harbour. Thus a small girl questioned me as I ran along Seaford front in high winds and rain drops that stung my face. The winds, so strong that at times they slowed me to a stop, may account for the slow pace of this session, over roughly the distance I shall race next Sunday in the Brighton 10K. Brighton will be flatter: today I ascended 765 feet, up Seaford Head, down into the Cuckmere, back up at the coastguard cottages and a final couple of mils on the flat of the front. It is now five years since this running fit started. This must have been my shortest-ever Sunday run, but was the first after the Beachy Head marathon, and an opportunity to explore new routes from my new home. So I ran to the station and back, to determine the distance for my walk to catch the train in the morning, 0.67 miles, and then set off up Seaford Head, running across the golf course, and back along the cliffs. 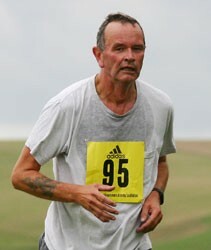 Everything worked, the hills were good for me, and I think I shall not disgrace myself in the coming Brighton 10K. Why was I slow? I think the main reason is lack of training. I have yet to work out how to fit regular running into my commuting. so while for previous marathons I have run four or five times a week, this time I managed two or, at best three. Long runs at weekends were less of a problem. What next? Brighton 10k and the Mince Pie Ten Mile will round off the year nicely.